Join Peter, Lois, Chris, Meg, Stewie, Brian and all of their friends in the incredible new Family Guy slot machine from IGT slots! This game is based on the TV show and features 5-reels and 30-paylines with world-class animations, familiar sounds and voices, and unmatched bonuses that will keep the entertainment going! 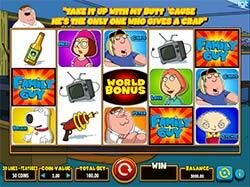 Join Peter, Lois, Brian, Chris, Meg, Stewie and all of their friends in the incredible new Family Guy slot machine from IGT slots! This game is based on the TV show and features 5-reels and 30-paylines with world-class animations, familiar sounds and voices, and unmatched bonuses that will keep the entertainment going! The game is set in the Griffin living room, while on the reels you’ll find all of the show’s lovable characters. You’ll find the entire Griffin family on the reels as well as Quagmire, Cleveland and Joe Swanson. Other symbols include a television set, a bottle of beer, a teddy, a ray gun and much more. Family Guy Wilds – The game’s logo is the wild symbol and substitutes for all symbols in the game except for the World Bonus symbol. Also, during the Lois feature it will not substitute for any of the family member’s symbols. World Bonus Feature – Land 3 World Bonus symbols in any position on reels 2, 3 and 4 to trigger the World Bonus. The first thing you’ll have to do is click the Globe to spin it and then after the Globe stops, one of three bonuses is awarded: The Drunken Clam, Chicken Fight, or Lois’ Hot Free Spins. The Drunken Clam Bonus – You’ll be sitting at the table in the Drunken Clam with Peter, Cleveland, Quagmire and Joe Swanson. Select one of the four characters to win from 25x to 1000x the coin value of the spin that triggered the World Bonus. The round begins with a 1x multiplier and increases as unselected characters collapse. Next select beer taps to win between 5x and 750x the coin value that triggered the World Bonus. Chicken Fight Bonus – Based on probably the most famous fight in the series between Peter and a giant Chicken, this bonus is triggered during the World Bonus feature. Select which of the two you want as your fighter. There are three rounds in the fight. 1 to 7 picks are awarded during the round and you’ll select sacks that hold between 5x and 1000x the coin value of the spin that triggered the bonus. The multiplier applied to wins increases with each round that passes! Lois’ Hot Free Spins Bonus – You’ll earn 10 free spins initially when you trigger this fun round which can see a lot of action! To start, get Peter Wild on a heart in any position on reel 5 to start filling the accumulators at the bottom of the screen. When all three hearts of the same color are filled, it too becomes wild! These symbols will remain for the current and remaining free spins. There is also a Quagmire symbol that appears on reel 3. Get one of these “Giggity Retriggity” symbols to win an additional 5 free spins. Peter’s Feature – When Peter’s feature is triggered, a value of 200x to 5000x the triggering coin value is awarded. Stewie’s Feature – When Stewie’s feature is triggered, up to 3 Wild Symbols could be revealed on any reel. This wild symbol substitutes for all symbols except the World Bonus. Lois’ Feature – When Lois’ feature is triggered, 1 to 3 of the the family symbols are indicated with the credit value increasing in worth. Brian’s Feature – When Brian’s feature is triggered, 1 or 2 of the World Bonus symbol on reels 3 or 4 will trigger the World Bonus.